Former First Lady Nancy Reagan, wife of 40th President Ronald Reagan, has passed away at 94 from congestive heart failure. Like her husband, Reagan got her start in acting, appearing in films throughout the 1940s and 50s. In 1952 she married Ronald Reagan, who at the time was the president of the Screen Actors Guild. The two remained together up until his death in 2004. She had been taking care of him for 10 years after he was diagnosed with Alzheimer&apos;s.
As First Lady, she&apos;s most known for her "Just Say No!" drug awareness campaign, for her taste in fashion (which was often controversial), and for being a powerful influencer on her husband while he was in office. 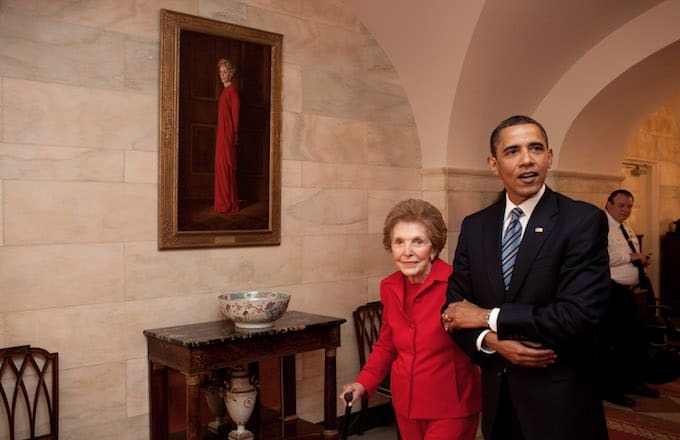 According to her representative Joanne Drake, "Mrs. Reagan will be buried at the Ronald Reagan Presidential Library in Simi Valley, California, next to her husband, Ronald Wilson Reagan, who died on June 5, 2004." Drake went on to add, "Prior to the funeral service, there will be an opportunity for members of the public to pay their respects at the Library."